On Wednesday evening I went into Ely to attend a talk by the historical novelist Philippa Gregory(http://www.philippagregory.com/books) give a talk in St Mary's Church. It was dark when we arrived and the constellation of Orion was spectacularly over the cathedral tower in the night sky. 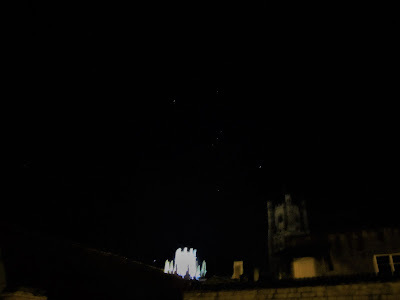 Orion appearing in the early evening night sky means wintertime is here. Scorpio's sting killed Orion the hunter and as Orion sets Scorpio rises in the winter morning sky. Shakespeare does not mention either Scorpio or Orion in any of his works. There are a few mentions of the signs of the Zodiac: Taurus in Twelfth Night (Act I, Scene 5), Virgo, Taurus and Aries in Titus Andronicus (Act IV, Scene 3) and Cancer in Trolleus and Cressida (Act II, Scene 3). Ursa Major (The Great Bear) is mentioned in Henry IV (Act II, Scene 1) and that is all. Shakespeare refers to the stars in the firmament in several places but most of his astronomical references refer to the planets, the Sun and the Moon. Shakespeare makes use of the attributes of the planets to describe the nature and dispositions of his characters and obviously found this was sufficient to meet his needs without delving too much into astronomy and leaving his audiences behind. However, I am sure the young Shakespeare in Stratford upon Avon must have looked up into the night sky and have seen the constellations. Ovid's stories of the zodiac such as Scorpio killing the mighty hunter Orion certainly inspired young Shakespeare's imagination and by looking at the night sky he would have seen the same constellations that Ovid saw centuries earlier.